Cellulitis is a suppurative inflammation involving the subcutaneous tissue. Usually, but not always, this follows some discernible wound. Cellulitis is a common infection of the skin. It happens when bacteria enter a break in the skin and spread. Bacterial infection may spread in dermis (the deep layer of skin) as well as the subcutaneous tissues, the fat and soft tissue layer that are under the skin. Some types of bacteria are naturally present on the skin and do not normally became harm. Bacteria can enter through cuts, grazes, or bites. The legs are most commonly affected. It can start suddenly, and it can become serious if not treated. If it spreads deeper into the body, it can be life-threatening. People with conditions, such as eczema or psoriasis may have a higher risk of developing cellulitis. Cellulitis nearly always responds rapidly to antibiotics. Cellulitis occurs when bacteria, most commonly streptococcus and staphylococcus, enter through a crack or break (like: injury, insect bites, or surgical incisions) in your skin. The incidence of a more serious staphylococcus infection called methicillin-resistant Staphylococcus aureus (MRSA) is increasing. 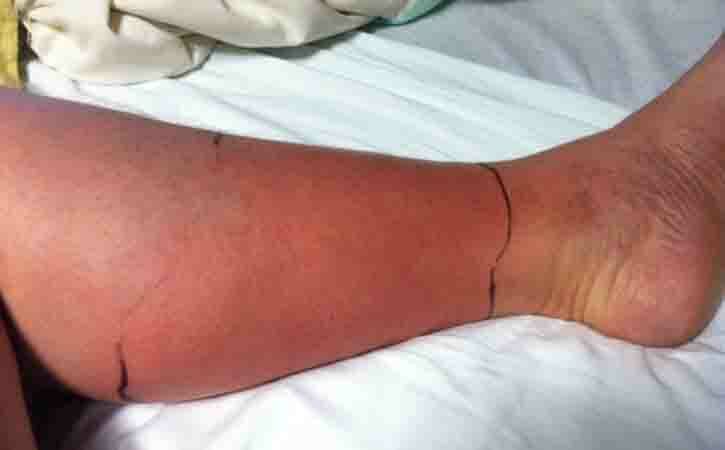 Animal bites can also a cause of cellulitis. Bacteria can also enter through areas of dry, flaky skin or swollen skin. Cellulitis needs early treatment. Early treatment with antibiotics is usually successful. It may treat at home, but sometimes need in hospital treatment. Initial empiric therapy with dicloxacillin or cephalexin for 5 days will usually suffice. Elevate the area. So that, it can help to reduce swelling and relieve discomfort. Use medication for pain relievers such as acetaminophen or ibuprofen to ease the pain, as well as keep fever down. Very young or very old. The cellulitis covers large areas, is on hands, or is close to body parts like eyes. In serious cases, may need to stay in the hospital. It will treat by IV antibiotics until the infection is under control (2 to 3 days), and then oral medicines may help. It’s important to identify and treat cellulitis early because the condition can spread rapidly throughout the body. Contact a doctor when suspected a symptoms arises.